The Complete Guide for Everything to See and What to do in Bordeaux, When you are not Tasting Wine! What to do in Bordeaux… Bordeaux is of course famous for its vineyards, legendary chateau and wine. But the city is also a popular tourist attraction with an incredibly long and rich History of Bordeaux that dates back to the days of the ancient Romans when it was known as Burdigala. 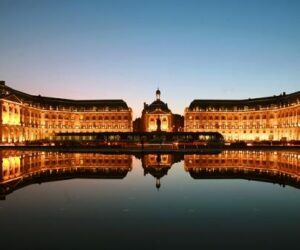 Recently named a Unesco Heritage City, Bordeaux is perhaps the largest city in France in size. 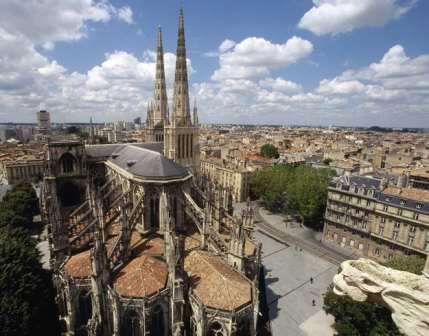 Bordeaux is also the second most popular tourist destination in France. Only Paris receives more visitors on a yearly basis than Bordeaux. How to get to Bordeaux: Bordeaux is easy to get to. If you arrive by plane, you’ll fly into the Bordeaux Merignac Airport. The airport code is BOD. If you are taking the train to Bordeaux, there are two train stops; Gare Saint Jean, which is the closest to the city of Bordeaux, or you stop in Libourne, which is located in the heart of the Right Bank, bringing you just minutes away from Pomerol and Saint Emilion. It’s easy to rent a car at either train station or the airport. Taxis are also readily available. You can also easily get to Bordeaux by car, should you wish to drive. Inside the city of Bordeaux: The actual city of Bordeaux is quite large. But most of what you will want to do is in the city center, so do not let the size of the city get to you. Here is a tip for you. Do not drive in the city. It is congested beyond belief and parking is close to impossible, unless you are lucky to find a space, or have a very tiny car. The city is filled with an endless array of impossibly small, twisted, one way streets that would quickly confuse any driver or navigation system. The streets are packed with cars parking in areas that were not designed as spaces. With cars jutting out from every angle, you will quickly become frustrated and miss out on a rich, cultural encounter. Trust me, I know from personal experience! Take taxis, walk, or use the easy to hop on tramway to get around. There are countless choices on Where to Stay in Bordeaux to fit any budget. Many of the world’s most famous vineyards located not far from the city. Pessac Leognan, which is the home of Chateau Haut Brion is the closest appellation, it is only about 20 minutes due south. The Left Bank, with all the famous 1855 Classified Growths of the Medoc is about an hour north and St. Emilion, with its stunning wineries and picturesque village is just under an hour away if you head east. If you do decide to visit the vineyards, Guide to visiting Bordeaux Chateau and Wineries will give you all the information you need for an unforgettable experience. What to do in the city center of Bordeaux: You can easily spend days in the city center of Bordeaux with so much to see and do. Bordeaux is a beautiful, untouched 18th century jewel. Bordeaux is an incredibly romantic city that maintains its French charm. While there are many modern, architectural improvements to Bordeaux over the centuries, it’s important to keep in mind, Bordeaux is a city with a history that you can see, touch and feel today. If you’re thinking of spending a day seeing the sights of Bordeaux, because its sheer height at 144 meters, the belltower of Saint Michel Basilica or the Gothic design of the Tower of the Tour Pey Berland are good places to start. The Bordeaux Opera House located right in the middle of the city center is close to the grandeur of the best Opera houses found in Paris, London and Vienna! Some of the cities most important historical sites include the Gothic designed Saint Andres Cathedral where Eleanor of Aquitaine married Louis VII, the future French King in 1137. Close to the Cathedral is the Palais Rohan, built in 1772 for the Archbishop Meriadec de Rohan which is stunning for its beauty and stone work. Couvent de l’Annonciade, designed in 1520 is one of the best preserved Renaissance cloisters in the region. There are small castles in the Bordeaux region including Chateau de Villandraut built by the Pope in 1305 and Chateau de Roquetaillade, constructed by King Edward in 1306. If you’re looking for something with more history, the Saint-Seurin Basilica dates back to the 6 century! If that’s not historical enough, you can always visit the Palais Gallien, which was the Amphitheater built by the Romans when they owned the region. If you are a history buff interested in the macabre, a visit to Place Gambetta is in order. Place Gambetta is where almost 300 unlucky souls, including a few famous chateau owners of the day, were Guillotined during the French Revolution. Today, it’s a town square, with neighboring gardens. Places to Relax and Enjoy the View in Bordeaux The Place des Quinconces next to the river provides a beautiful relaxing experience. Or, why not enjoy a leisurely stroll in the Jardin Public? Another picturesque park located in the city center is the Parc Bordelaise. While in the city of Bordeaux, don’t forget to visit the Place de la Bourse, with its breathtaking architecture that is the equal of any of the great European cities. Located just in front of the Place de la Bourse you’ll discover the unforgettable, reflecting pools known as the Miroir d’Eau. You can walk in the pools! And speaking of water, several attractions located on the river are worth your time. It’s easy to spend an afternoon strolling along what is known as The Left Bank Quays, meaning riverside. There is a long, rambling walkway giving you views of the city on one side and the Garonne river on the other. There is also the Porte Cailhau, built in 1406 and the modern looking Jacques Chaban-Delmas bridge holds the record as the tallest lift bridge in Europe you can stop by during your walk. Several different companies offer day and evening cruises along the waterfront. You can also enjoy a cruise along the river that includes wine tasting and visits to chateau located close to the water. Uniworld and Viking Cruises are two of the larger companies offering those daytime excursions. Bordeaux is also the home to several museums including the CAPC, the Museum of Modern Art, known locally as the Musee d’ACt Contemporain, located in a converted, stunningly beautiful, former colonial warehouse and the Museum of Aquitaine, known locally as the Musee d’Aquitaine, which houses various historical items. One of the more unusual museums that could only exist in Bordeaux is the “Musee de Vin et Negoce” which is devoted to Bordeaux negociants. The museum is located in the Chartrons area, which is the old negociant quarter. For an added touch of history, the museum is housed in the original cellars that were once used by the official wine merchant King Louis XV, the King of France. Shopping in Bordeaux If you need, or just want to shop, there is a large area of cafes, bistros and stores offering everything from high end merchandise to souvenirs. The most famous shopping location is the impressive Galeries Lafayette department store located on Rue Saint Catherine. Allees de Tourny is where you will found countless stores and boutiques. You can also find world class shopping on the Cours de l’Intendance Cours Clemenceau. In fact those three streets are known by locals as the Golden Triangle. For a less expensive day of shopping, there is the popular Rue Sainte Catherine that is also filled with various cafes. Bordeaux the home to the world’s greatest wine museum, “La Cite du Vin.” Located on the bank of the Garonne river, the facility offers everything you want to know about wine. The stunning, wine center of Bordeaux, “La Cite du Vin” opened in 2016. “La Cite du Vin” is a new, 100 Million Euro, massive, multi storied, 13,350 square meter, architecturally designed facility that is devoted to Bordeaux wine, wine culture and wine history. With dozens of interactive exhibits, it is easy for anyone to learn about how wine has changed and shaped the world in a myriad of different exhibits. There is a wine themed restaurant with a stunning view of the city and waterfront, wine store and wine bar as you might expect too. While Bordeaux is of course front and center, “La Cite du Vin” is focused on wine and wine culture from all over the world. Bordeaux is packed with annual events In the spring months, depending on your timing, you could see the new vintage developing as the flowering of the new harvest takes place. The annual tastings of the new vintage by professionals takes place about the first week every April, which is a madhouse, but quite fun. However, the week is really for professionals only. In May, you can watch or participate in the Medociane, a popular bicycle race which has racers riding through the vineyards. The riverfront in the city is the site for the Fete Le Fleuve which also takes place every year in May in odd years only. One of the festival highlights is the famous Solitare du Figaro, the individual endurance yacht race, which kicks off in Bordeaux. If you’re a strong swimmer, or if you enjoy people that are, once the weather warms up, you can participate or just watch the annual swim across the river known as La Traversee de Bordeaux. Every June, at the end of the month, the Bordeaux region celebrates each new vintage with the annual Fete de la Fleur, which is a celebration featuring the Bordeaux Wine Festival. The colorful, wine filled event takes place in the city of Bordeaux. Vinexpo in Bordeaux takes place in odd numbered years. Vinexpo is the world’s largest wine and spirits convention. More than 50,000 visitors come to Bordeaux to take part in Vinexpo. Vinexpo takes place in the convention center, not far from the city of Bordeaux. July in Bordeaux is when music stands out. The two most popular events are the Les Grand Crus Musicaux and the St. Emilion Jazz Festival. This is followed by the world famous, Marathon du Medoc. The 26 mile run traverses the entire Medoc and travels through many of the world’s most famous vineyards. Several of the teams feature runners that own or work at many of the top chateaux. Harvest in Bordeaux: Of course the most important, and potentially the most beautiful of all times to be in Bordeaux is during the annual harvest which can, depending on the vintage, take place from mid-September to the middle of October. While it’s quite difficult to get an appointment at most chateaux during harvest, if you are in Bordeaux at the time, there is nothing like the sights, sounds and smells of a harvest. It can rain during harvest time, especially if the picking takes place closer to October, so bring an umbrella! If you have young kids and are visiting Bordeaux, as wineries are not going to be much fun, you always take a break and bring them to the just opened Trampoline Park. Saint Emilion, which is declared a UNESCO World Heritage Site offers plenty to see and do. Stroll the ancient cobblestone streets and get lost in what many say is “the most beautiful of all the wine producing villages in France.” Visit the famous, Monolithic church, Eglise Monolithe, which has a Romanesque feel and catacombs. The church was built in about 1200 out of solid blocks of limestone. With its beautiful design and stained glass windows, it’s worth your time to see. It’s important to note that the only way to visit many of the underground caves and historical sites is by taking the underground tour. You can walk in the Cloitre des Cordeliers, which was built on an old Franciscan friary, located right next door to the church. You can also climb the 196 stone steps to the top of church for a great view. And if stairs and views is your thing, your next stop should be the Kings Tower in the center of the village. If you’re up for it and want to experience truly, unparalleled views of St Emilion and its vineyards, climb to the top of the tower. There is nothing like it in any wine region! You can take a tour of the famous, limestone caves underneath the ancient village. There are numerous cafes, wine bars, charming stores and streets to wander in to keep you busy. What to do when you want to take a break from Bordeaux and leave the city: In the often blazing dry heat of the summer months, many chateau owners leave the vineyards for at least the weekend and drive to either Cap Ferret or Arcachon to enjoy the beautiful beaches and of course, the fresh caught oysters. If you also want to visit Cap Ferret or Arcachon, it takes about an hour from the city of Bordeaux. In Cap Ferret, dine at Chez Hortense and order the mussels and frites. The Dune of Pilat in Arcachon is a sight to see. It is the largest sand dune in Europe. Plus the beach is beautiful and the oysters in Archaon are famous. For a night of luxury in the neighborhood, stay at Hotel La Corniche. Biarritz, another beautiful, French seaside resort is only 90 minutes from Bordeaux. The picturesque, waterfront region of Dordogne is just over an hours drive from Libourne. Other destinations within a 2 hours of Bordeaux worth seeing are: Lourdes which is only 2 hours by TGV. You can also drive to Bergerac and Perigord, which a charming region with unlimited foies gras, truffles and a few golf courses. Toulouse, which offers a lot to see and do is only 2 hours from Bordeaux by TGV. Another way to spend a weekend away from Bordeaux is to drive to San Sebastian Spain. It takes about 3 hours by car and it’s well worth the trip. If you don’t have a car, or prefer not to drive, you can take a train, which takes you about 3 hours in total. What you do is, take the TGV to the Hendaye station. From there, you transfer to the local, fast Spanish train, the Euskotren, which only takes about 10 minutes before you’re in San Sebastian. The restaurants and Tapas bars in San Sebastian have no equal. There are also several 3 Star Michelin restaurants in San Sebastian. And if all that is not enough for you, remember, you are close to Paris. It takes only a little more than 2.5 hours by train if you take the TGV. The newly finished Fast Train takes about 2 hours! You are also not that far from Lyon, the gateway to Provence, southeast France and the Rhone Valley. You can easily fly to Lyon in a hour. Or, using the TGV, you are about 5 hours from Lyon.